Toulouse, in Occitan Tolosa, by citizens of the city often called „LA Ville Rose“ (the red or pink city), because of the pink glow that some buildings emit. This is explained by the red coloured bricks. The towers and churches; whole the city was red, dark pink like a flower, the rose which welcomed her today morning as she waked up . She remembered that Toulouse, build of pink coloured bricks and red marble, was called the Red Rose City. We can find famous red marble quarries halfway between Toulouse and port Narbonne, in Caunes-Minervois, department PEYRIAC-Minervois. 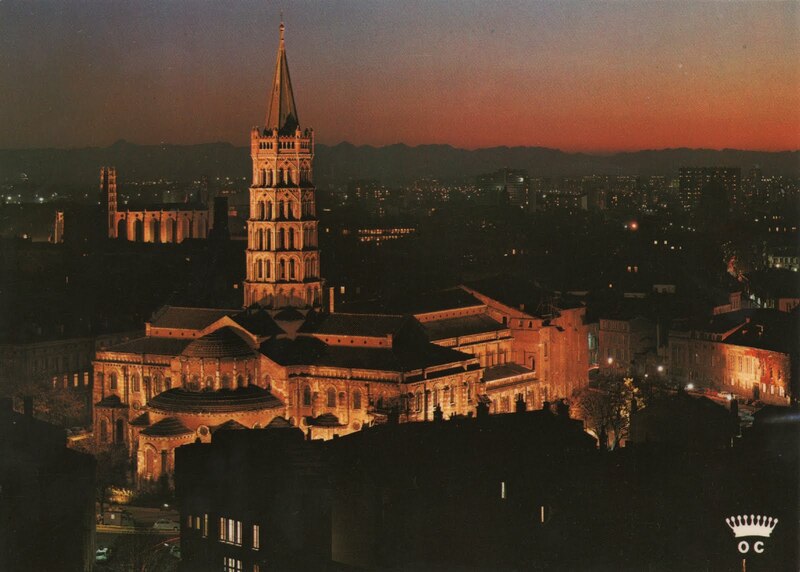 For example the Capitol of Toulouse is a beautiful building with eight columns of pink marble on its facade. The structure alternates red and light pink, resulting in a beautiful building. We could call Toulouse as well The Violet City, because the violets are there everywhere.. The violet is a symbol of Toulouse. ...... When she took her place in the carriage, he put bunch of roses and few bunches of violets at her knees..
....... organized little afternoon party with confection, orange blossom and violets cakes. Violet candy, in Occitan language "Bonbon a la violeta" which did like Joffrey de Peyrac so much you can still buy today in city of Toulouse. “Violette de Toulouse” is one of the most famous French candy. In a bowl, beat egg whites with a wire whisk just until frothy. Place sugar in another bowl. Taking one violet at a time, pick it up by the stem and dip into egg whites, covering all surfaces. Gently dip into the sugar, again being sure all of the petals, top and bottom, are covered. Place on waxed paper-lined baking sheets; snip off stems. Using a toothpick, open petals to original shape. Sprinkle sugar on any uncoated areas. Dry in a 200° oven for 30-40 minutes or until sugar crystallizes. Gently remove violets to wire racks with a spatula or two-tined fork. Sprinkle again with sugar if violets appear syrupy. Cool. Store in airtight containers with waxed paper between layers. The cathedral where Angelique and Joffrey got married. The Basilica of St. Sernin is a church in Toulouse, France, the former abbey church of the Abbey of St. Sernin or St. Saturnin. It was built in the Romanesque style between about 1080 and 1120. 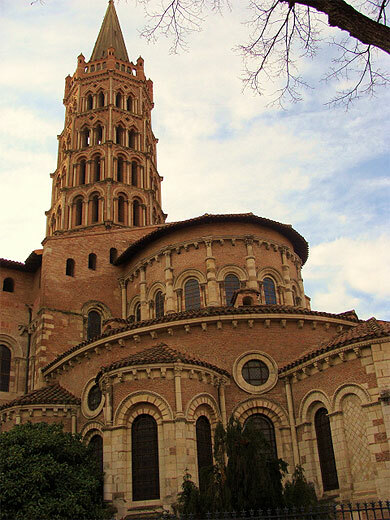 It is located on the site of a previous basilica of the 4th century which contained the body of Saint Saturnin or Sernin, the first bishop of Toulouse in c. 250. The abbey of St. Sernin was an ancient foundation, but its importance increased enormously after Charlemagne donated a quantity of relics to it, as a result of which it became an important stop for pilgrims on their way to Santiago de Compostela, and a pilgrimage location in its own right. The current building was built to accommodate these pilgrims. The plan of the abbey church here was also used in the construction of the cathedral of Santiago de Compostela, "begun in 1082, too direct a copy to have been done by any but St. Sernin's own architect or his favorite pupil", but finished much earlier. The stone that killed Simon de Montfort in 1218, while he was besieging Toulouse, was thrown from the roof of St. Sernin's. In 1860, Viollet-le-Duc restored the church, but his changes are currently being removed to restore the original appearance. When you look at the plan of this large basilica in the southern French city of Toulouse, it follows a classic gothic cathedral layout. A basic cruciform shape that has a long knave with two aisles each side, a transept with two arms also with side aisles, and a spire/bell tower over the centre of the cross. But when you look at the details of this intriguing church, it appears to be more Byzantine than gothic. 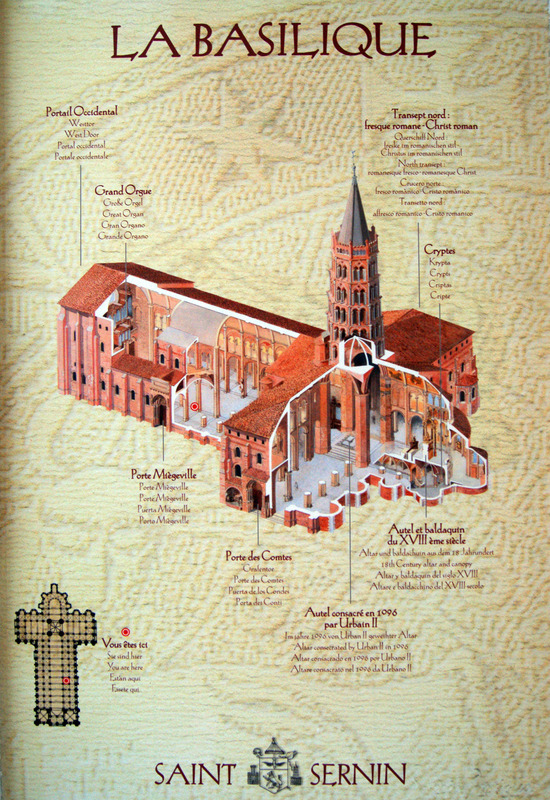 Plan of Basilique St. Sernin with Porte de Comtes - Entrance for the Comtes of Toulouse at the south side of the cathedral. When Henry IV acceded to the throne, disorder ended in Toulouse. The parlement recognized the King of France, the edict of Nantes was accepted in 1600 and the Capitouls lost their remaining influence they had. A threat more serious than the Fronde reached Toulouse in 1629 and 1652: plague. For the first time, the city and the local parlement cooperated to assist those affected by the epidemic. Most of the clergy and the wealthy left the city, but doctors were required to stay. Starvation led the remaining Capitouls to prevent the butchers and bakers from leaving. La Grave Hospital accommodated those affected by the epidemic, quarantining them. The Pré des Sept Deniers also accepted many patients under hazardous conditions. Before closing its gates, the city attracted the poor with a medical infrastructure offering more hope than the countryside. However, during plague-free periods two major projects were completed: the Pont-Neuf in 1632 and the Canal du Midi in 1682. Famine occurred in 1693. **** From the first book Angelique we do know about Joffreys family, that Joffrey was the youngest and last surviving descendant of the Counts de Toulouse. His father did die because of a poison. His mother and his older brothers were not anymore alive, when he returned from his travels exploring the world. Maybe they did die from a PLAGUE?